Evangelicals Pray To Protect Trump From Witches - Joe.My.God. 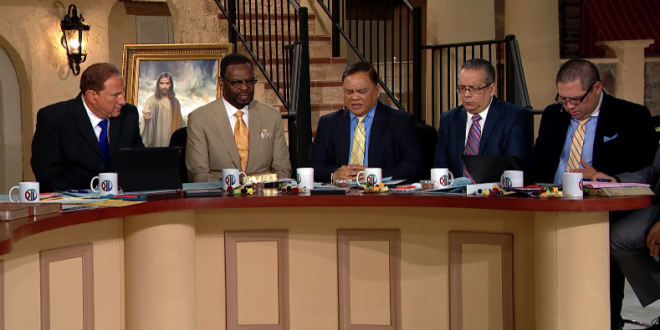 When tsunami-stopping and ant-reviving pastor Frank Amedia appeared on “The Jim Bakker Show”, he was joined by several members of his POTUS Shield organization, who collectively engaged in an extended prayer to protect President Trump from the “evil forces” of the deep state, in addition to the “witches and warlocks” who have been cursing him. RELATED: Longtime JMG readers may recall that in 2012 Harry Jackson claimed that he laid his hands on a pile of copies of the the LGBT newspaper The Washington Blade and “cursed them” into bankruptcy. The Blade remains in operation.